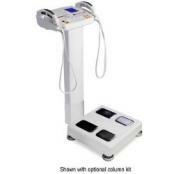 Body composition analyzers (BCAs) are designed for professionals who want better results for their clients on a more personalized level. These feature-rich, standalone devices provide the highest accuracy available, yet maintain affordability and incredible durability—essential for busy fitness clubs and health practices. Rice Lake’s Competitor Series BCAs incorporate the most advanced bio-electrical impedance analysis (BIA) technology with eight electrodes for all total body models. This technology provides precise and dependable results comparable to the highest standards of isotope dilution and DEXA analysis. Multi-frequency analysis is the most accurate BIA technology available and gives providers information needed to improve weight programs and health plans. With Competitor Series BCAs, bio-electrical impedance analysis is performed simultaneously through both handheld monitors and scale-base electrodes. This multi-frequency method allows improved cellular penetration, superior accuracy and ultimate data collection. Segmental analysis offers an in-depth look at lean body mass distribution in five body segments. It allows professionals to personalize training and suggest exercises focusing on arms, legs or trunk that relate to the client’s overall picture of health. 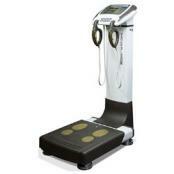 Rice Lake Body Composition X-ScanPlus 950The X-Scan Plus 950 provides a total picture of health for all body types. Six frequency ranges from low to high allow better cell membrane penetration for a more in-depth analysis. The detailed analysis breakdown includes a segmental ratio of extra cellular water to total body water. Eight previous analysis measurements of E.C.W./T.B.W., P.B.F., S.L.M., and weight are used to track progress. Weight is only part of a client’s fitness story. BCAs provide detailed data about a client’s overall picture of health, keeping the focus on body composition and not just a number on a scale. With BCAs, professionals can cater individual programs and create goals for each client with printable results and goal tracking software.